Suitable for sensitive eyes and contact lens wearers. Removes all make-up, even waterproof. Non greasy. Bi-phase. Tested under ophthalmological control.An innovation from the L'Oréal Paris Laboratories, Absolute Eye & Lip Make-Up Remover is specially formulated for waterproof and long-lasting make-up. It effectively removes make-up whilst leaving your skin soft, with no greasy sensation. 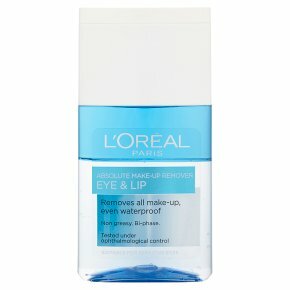 The blue phase, enriched with gentle oils, effectively dissolves waterproof and long-lasting make-up. The clear phase is a soft lotion to leave your skin with a pleasant fresh sensation. Results: Quick and easy make-up removal, with no greasy residue. Shake well before use to mix the two phases.